Love & Lentil: My first Blog Award! One of my reader friends EC from Simple Indian Food Blog passed me my first blog award. Thank You EC for the wonderful support! 1. You must thank the person who has given you the award. Done! 4. Name 7 things about yourself that people might find interesting. Done! 5. Nominate 7 other Kreativ Bloggers. Done! 6. Post links to the 7 blogs you nominate. Done! 7. Leave a comment on which of the blogs to let them know they have been nominated. Done! 2. I love to entertain - I would hate to cook the whole day, but in the evening if one of my friends calls me and says she's coming over, I can cook a five course meal with a lot of enthusiasm. 3. I live for Chocolate. I can give up anything in this world but chocolate. Terrible sweet tooth. 4. I stood for some post in my college election and lost miserably! Excuse - I was in the evening college in Ethiraj and we were the minority! No one really knew us. We came to college after most of the college left. 5. Someday I want to get a tattoo...maybe on one of my bday's as a gift to myself! 6. Big Music fan - my Ipod is glued on to my ears half the day - the other half the music plays on my player or my laptop! 7. Very sociable person - love my friends..I'm more close to my friends than my relatives or family. In other words, a big chatterbox! 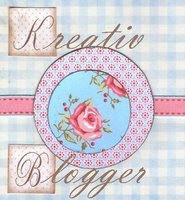 Here are my 7 nominees in no particular order for the Kreativ Blogger Award! There are so many more great blogs - Congrats everyone on working so hard! thank u so much for the award! will surely add it soon!